Dozens of ISIS fighters are dead after President Obama authorized B-2 bombers to strike two training camps in the Libyan desert late Wednesday night, in what was likely Obama’s final act as commander-in-chief. The 80 militants killed at the camp “were actively plotting operations in Europe and may also have been connected to attacks that have already occurred in Europe,” Defense Secretary Ash Carter told reporters Thursday. Carter added that the fighters were on the run from the coastal city of Sirte, a former ISIS stronghold that was taken back after a five-month campaign that ended in December. CNN reports that the U.S. surveillance aircraft have spent weeks monitoring the camps, which were about 28 miles southwest of Sirte. Despite retreating to a remote part of the desert, the fighters remained clearly visible because they were out in the open. 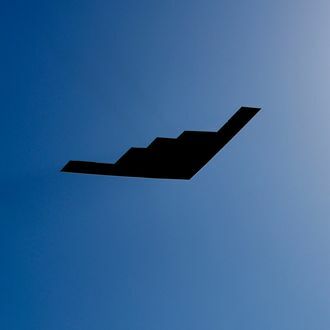 The airstrikes began with 108 precision-guided bombs dropped from B-2 aircraft that took off from Missouri. Those were followed by Hellfire missiles launched by unmanned drones. The assault was undertaken at the request of Libya’s Government of National Accord, the U.N.-backed government hoping to rule the country, Pentagon Press Secretary Peter Cook said. And to demonstrate that the target was what he said it was, Cook showed reporters video of men, described as ISIS members, moving weapons in the area where the bombs were dropped.